Graham Bellinger Solo - grahambellinger's JimdoPage! 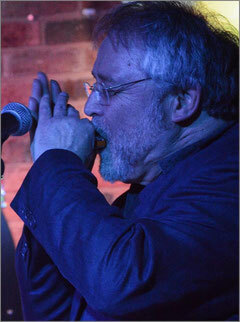 Graham sings and plays folk-based music on guitars of every variety, mandolin, mandocello, harmonica, melodeon and banjo. His repertoire ranges from American blues, ragtime and country music to British traditional songs and material by modern songwriters, including himself. Each and every song is presented with the warmth, humour and commitment it deserves so that all types of audiences can enjoy them. His solo work now includes workshops for clubs and festivals on the history and performance of the blues and Americana and on guitar styles and techniques. He also sings popular songs for residents and staff at hospices and residential homes. Graham has had a weekly residency at Alexanders in Chester for the last twenty years (!) and was resident soloist at Chester’s Raven folk club for many years. He is a regular and effective host and MC for concerts, open mic nights and clubs and is known for his supportive and good humoured style.